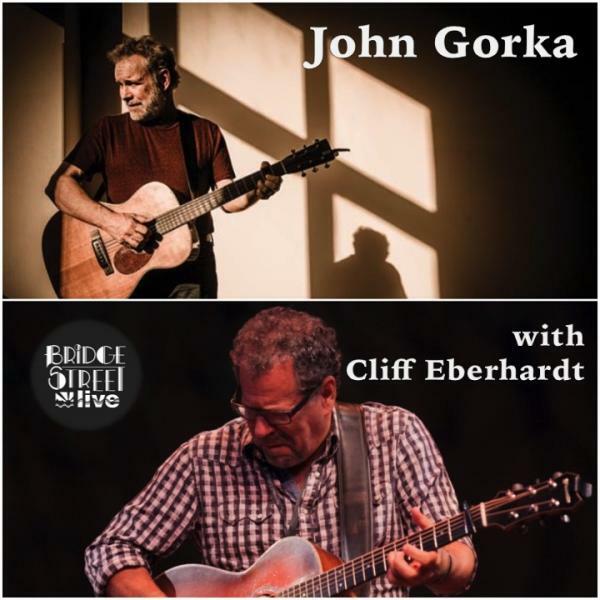 41 Bridge Street is thrilled to announce JOHN GORKA with CLIFF EBERHARDT on Saturday, September 17th at 8 PM! Since his 1987 Red House release, I Know, introduced renowned artist John Gorka to the public, the Minnesota-via-New Jersey guitarist and songwriter’s wit, insight and honesty has made him one of the most respected, beloved songwriters currently carrying on the folk tradition. Gorka has appeared with artists such as Suzanne Vega, Shawn Colvin, Michael Manring, Christine Lavin, Dave Van Ronk, Frank Christian and Lucy Kaplansky. Gorka joined Kaplansky and Eliza Gilkyson in 2010 to form the folk supergroup Red Horse, touring together and releasing a self-titled album on which they recorded each other’s compositions. “Listening to John Gorka sing, one can get goosebumps all over. There are many reasons—fresh lyrics, a stunning, emotional baritone voice, his twisted humor—but to focus on one limits the experience” (The New York Times). New York-based singer/songwriter Cliff Eberhardt’s expressive voice and dynamic guitar style make for some of the most moving "new folk" music of the '80s and '90s. Like John Hammond and Richie Havens, Eberhardt continues to carry the torch for traditional and contemporary folk music through his strong live shows. Whether he's out on tour solo or with a small band, Eberhardt's guitar playing, singing, and original folk songs and blues make for a compelling, thought-filled, emotional roller coaster of a concert. "Eberhardt is a superb singer, with a vast credible range of emotions, and a soulfulness that draws from rock and pop, but also from the best folk ballad styles” (The Boston Globe).